If a device can control human hands, the device can be use- ful for HCI and tangible application’s output. To aid the controlling of finger movement, we present PossessedHand, a device with a forearm belt that can teach when and which fingers should be moved. 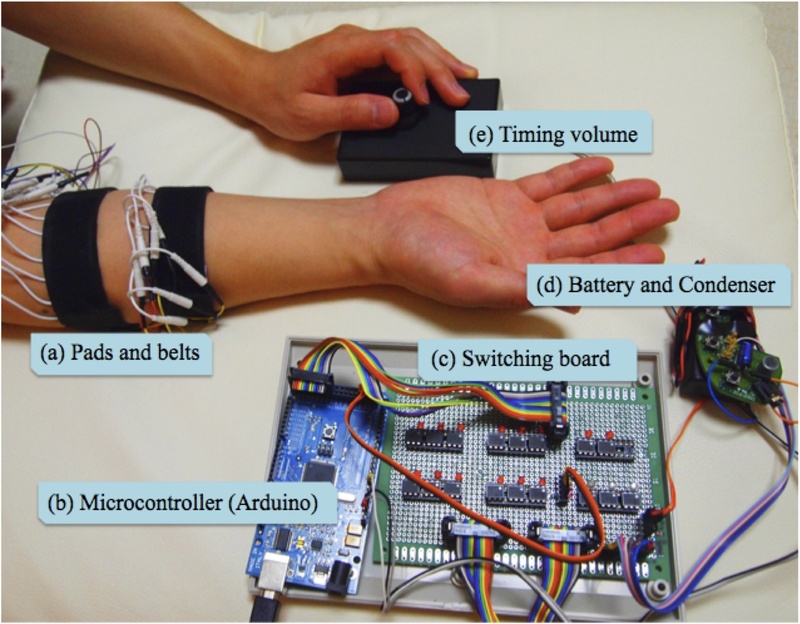 PossessedHand controls the user’s fingers by applying electrical stimulus to the muscles around the forearm. Each muscle is stimulated via 28 electrode pads. Muscles at different depths in the forearm can be se- lected for simulation by varying the stimulation level. PossessedHand can automatically calibrate the system for individuals. The automatic calibration system estimates rela- tions between each electrode pad, stimulation level and mus- cle movement. Experiments show that PossessedHand can control the motion of 16 joints in the hand. We also present an application of this device to help a beginner learn how to play musical instruments such as the koto. 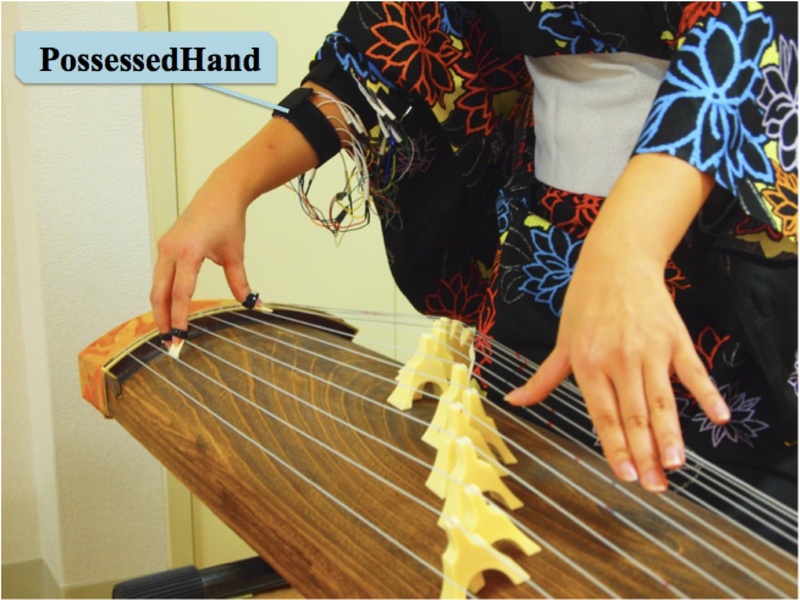 Pingback: Tokyo researchers hijack your hand, help you play the koto (video) | Shopping Reviews, Shopping Advice Plus More! Pingback: Tokyo researchers hijack your hand, help you play the koto (video) | chatroulette french Tokyo researchers hijack your hand, help you play the koto (video) | frogs like chat roulette! 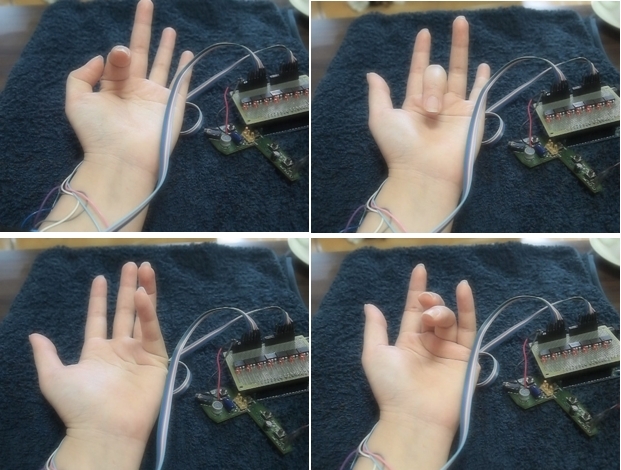 Pingback: Tokyo researchers hijack your hand, help you play the koto (video) — HotChatrouletteVideos.com – The Hottest Chatroulette Videos | We Have Chatroulette Girls getting Naked! Pingback: Tokyo researchers hijack your hand, help you play the koto (video) | Getting Ripped off By Rudester? Pingback: Pesquisadores japoneses criam forma de controlar sua mão através de estímulos eletrônicos « Do outro lado !!! Pingback: Tech Reviews » Arm electrodes to electrify your guitar skills? Pingback: This and that | Ripple's Web » Arm electrodes to electrify your guitar skills? Pingback: guitar » Blog Archive » Arm electrodes to electrify your guitar skills? Pingback: New Technology Possesses Your Hand To Play Music | Techni Glee!